Home > Seattle University > Seattle U's All American Johnny O! OLD GRADS will exchange the usual embraces, there'll be the usual dinner parties before the Homecoming Ball and the halls of Seattle University will echo once again with the voices of its favorite sons and daughters. It's Homecoming time, the 48th annual get-to-together for Seattle University graduates of yesteryear, but there'll be one common denominator for conversation: JOHNNY O'BRIEN. Never in the history of Seattle U. has one student brought such fame to the old school, and never in its history has the name of one student become such a household word the nation over. This Homecoming, the "must" event on the calendar is Saturday night, January 24, when the O'Brien-led Seattle University Chieftains battle the University of San Francisco Dons on the Civic Auditorium court. The annual Homecoming game will take on added significance as the famed "Johnny O" moves closer to the goal never dreamed of before by a college basketball player: a 3,000-point career scoring record. At this writing, Johnny O. has collected 2,788 points and stands a scant 212 points away from that mark. Johnny needs just 115 points to eclipse the former college career scoring mark set back in 1950 by Nate DeLong of River Falls State Teachers College. The year past has seen Seattle University emblazoned across the nation's sports pages. There was the highlight of last season on January 21, 1952, when the world-famous Harlem Globe Trotters tested the Seattle University Chieftains and bowed, 84-81, in a donnybrook of a battle that gave the hot-stove league their warmest topic in a decade; there was the bid to the National Invitational Tournament in Madison Square Garden and the big news when Johnny O'Brien broke the U. S. scoring record and was named an All-American. 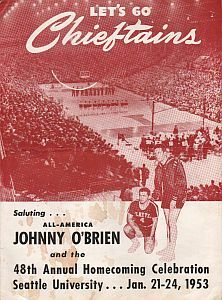 This season has produced new fame, starting with the Chiefs' Eastern road tour and their victories over New York University in the Garden; the nod over St. Joseph's in Philadelphia's Convention Hall, the Boston Arena win over Boston College, and recognition as a "major college" by the National Collegiate Athletic Association. This season had a "January climax," too, with the selection of Johnny O. as the "Man of the Year" by the Seattle Post-Intelligencer's sports tribunal. But all the honors to Johnny O. haven't turned the head of the 5-foot 9-inch mite from South Amboy, New Jersey. He best testified to that with his classic "Joisey" tribute to his teammates on the night he hit the 1,000-point mark last season. "I want to thank all the boys for their help for without them I never would have got where I got." No story about Johnny O. would be complete, however, without due credit to his running mate and the team's play-maker, Eddie O'Brien, who is destined for big things in professional baseball with brother John at the end of this season. And no Homecoming recapitulation would be fair without a glowing tribute to the "other guys," all out­standing players in their own right who gave Johnny the help to get "where I got." They included the stars of last season, Les Whit­tles and Bill Higlin, and the stalwarts this year, Ray Moscatel, Jack Doherty, Wayne Sanford, and Stan Glowaski, and their helpmates, Joe Pehanick, Gordy Hein, John Kelly, Jack Johansen, Bobby Malone, and Ron Bissett. They've played the kind of team basketball that wins, and helping Johnny O.— they prefer to call him "Shots"— was part of the game. Some rugged opponents are on the calendar before the Chieftains write finis to the 1953 campaign. There's Loyola of Los Angeles, Montana State, Portland, Creighton, and a return match with Gonzaga before the end of the trail, and there's a good chance the Chiefs will play in the NCAA regionals at Corvallis. If fate steps in, there's also the possibility that the Chiefs could be matched against the University of Washington in the NCAA tourney and settle the cross-town arguments about the merits of Coach Al Brightman's stalwarts and the Huskies of Tippy Dye. As another Johnny O'Brien, of Aqua Follies fame, would say: "IT'S POSSIBLE!"